Social video expert Be On evaluates the latest viral campaign from Red Bull. While it starts a bit too slowly, the seven-minute film will end up captivating audiences. Imagine the fun to be had as a child if you were the same size as your toys. With help from Red Bull, Danny MacAskill did just that. The Scottish trials cyclist was transported to his childhood bedroom, of a very different size this time, to conduct a mix of stunts. The gig included riding and jumping over alphabet blocks, coloured pencils, a train set and a toy-tank plus many other fun objects that can be found in a young boy’s bedroom. 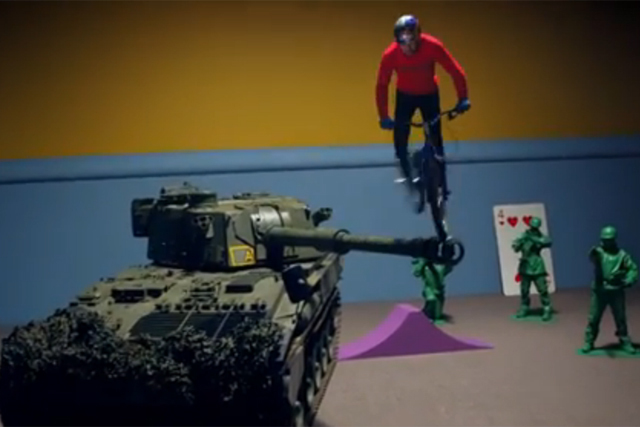 The video was the finale project to the series "MacAskill’s Imaginate", that took more than a year and a half to film. In the last two months, viewers were teased with a series of episodes that captured preparations to the great finale. Red Bull yet again proved that an imaginative idea and good video content is the key to creating engaging viewer experience. Focusing on a bigger picture is another approach that has helped the brand’s video strategy for a while now. Instead of creating a single piece of content, Red Bull made a series that’s drawn a deeper, more engaging story. The audience has been taken on a journey, with MacAskill’s new riding film as the final stop; the cherry on top. While it starts a bit too slowly, the seven-minute film will end up captivating audiences and get them to come back for more. And, based on their previous form, if there is one thing we know about Red Bull’s there will be more and it will be big.